The tracer detects that the second segment is on the planet Calufrax - somewhere that the Doctor is less than enamoured with. The TARDIS makes a very bumpy landing and when the Doctor and Romana leave to find the segment they discover that they are not on Calufrax at all, but on a planet called Zanak. Zanak is in fact a hollow planet, which has been fitted with engines so that it can transmat through space and materialise around other planets - such as Calufrax - and drain them of their energy and minerals, leaving them as shrunken husks held by gravitational forces in a 'trophy room' on Zanak. Zanak is governed from a complex known as the Bridge by the Captain, half-man half-robot, who is in thrall of his Nurse, in reality a projection of the aged Queen Xanxia whose real body is held in stasis by a time dam. She is using the power taken from the plundered planets to keep the dam operational until her new, younger form becomes stable and permanent. The Captain prepares Zanak to 'jump' again and this time the target is a planet rich in PJX18 (quartz) which can be used to repair the engines. The planet chosen is Terra, known to the Doctor as Earth. 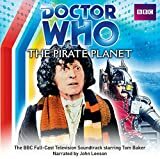 The Doctor realises the truth about Xanxia - that there is no amount of energy that will give her a permanent new form - and attempts to stop Zanak from destroying the Earth. In this he is aided by the Mentiads, a gestalt of telepathic dwellers on Zanak who are sensitive to the life force of the planets that are destroyed. Under the Doctor's supervision they damage the engines by using telekinesis literally to put a spanner in the works. The Captain asserts his independence and tries to free himself from the Nurse's control but she kills him instead. The Nurse herself is destroyed by Kimus. The Doctor obtains the key, which he has realised is the whole planet Callufrax, by dropping the compressed husks of the planets into a space/time vortex created by the TARDIS in the centre of Zanak and then picking up the key at his leisure.